Sometimes it’s easier to let someone know how you feel by using a hand gesture rather than actually speaking. Hand gestures are also universally understood of course, and very useful if you find yourself in a foreign country where you don’t speak the language. Just do the V sign if you want someone to get lost and the thumbs up gesture if you think the food is great in a restaurant. 1. the “wanker” gesture (as demonstrated by a rather young looking man before he became prime minister of the UK). 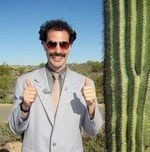 2. the “thumbs-up” gesture (as demonstrated by our very funny friend Borat who has transformed himself into the equally funny Bruno). 4. the “Corna” gesture (as demonstated by fans of heavy metal music and…O my God! …Is that who I think it is? The lovely Chrishirl Teng? I didn’t know she was a fan of heavy metal…and what the hell is she trying to do with her tongue? Yummy!!!!!!!! 5. the “V sign” can either be done with the palm faced inwards – when it is very rude indeed – or with the palm faced outwards when it means peace (as demonstated again by the wonderful Chrishirl Teng). …but her body language skills are not so good now it seems. 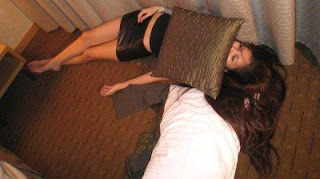 Get that pillow off your head, my dear!